After nearly 17 years, Ann Cravero will step down as director of the Drake Opera Theater after leading the production of “The Magic Flute,” May 4-6. This weekend the Drake University Music Department presents The Magic Flute, an opera known worldwide for its timelessness and beauty. The German comedy in the form of Singspiel, which includes both singing and spoken dialogue, premiered in the Freihaus-Theater auf der Wieden in Vienna, Austria in 1791 and has impressed audiences ever since. Presented as a collaboration of more than 60 students, faculty members, and professionals, Drake’s production will be a final bow for Associate Professor of Voice Ann Cravero, who plans to step down this spring as director of Drake’s Opera Theater after nearly 17 years in the role. 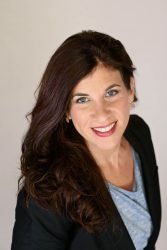 Cravero is looking forward to continuing her work as a full-time voice faculty member teaching diction, vocal pedagogy and studio voice, as well as pursuing outside professional singing and directing opportunities. 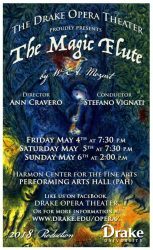 The Magic Flute runs Friday, May 4 through Sunday, May 6. Showtimes are 7:30 p.m. Friday and Saturday, and 2 p.m. Sunday; tickets are $15 for adults and $10 for students, seniors, and anyone with a Drake ID. Tickets can be purchased at www.drake.edu/fineartsboxoffice/. 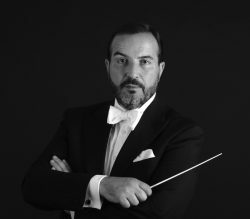 Stefano Vignati, conductor of “The Magic Flute,” will assume the role of director of Drake Opera Theater starting next year. The production is conducted by Maestro Stefano Vignati, adjunct instructor of voice and instructor of Italian with the World Languages and Cultures Department. Professor of Voice Leanne Freeman-Miller is the production’s musical director, and Ellis and Nelle Levitt Distinguished Professor of Conducting Aimee Beckmann-Collier is chorus master. Vignati will direct the Opera Theater starting next year. Vignati described the opera as a partnership between music and theatre, with music taking the lead. He said that it’s not only a great experience for singers but for actors as well, because it provides them with plenty of valuable stage time. According to Lind, the collaboration between musicians with different areas of expertise –vocal and instrumental–is fantastic. This is Lind’s second performance of Mozart’s The Magic Flute. Meanwhile, Vignati is a veteran of the opera: He has taken part in 15 productions during his 30-year career. “I know this opera better than the story of my family,” laughed Vignati. While the name of the opera hasn’t changed in its almost 300 years of existence, the differences in each performance lie within its interpretation, he said. Like many professional companies and theatres that produce this opera, in addition to the dialogue being spoken in English, subtitles will be provided during the singing parts, which are in German, so that the audience is able to follow along and understand the story. To first-year vocal performance major Bailie Bautch-Breitung, The Magic Flute is special because of its diversity in music, as it includes songs that range from exciting and uplifting, to dramatic and sorrowful. “People should come experience this opera because it is an extraordinary opera full of love, mystery, and comedy that everyone can enjoy,” Bautch-Breitung said.